How do you make your readers cry? I promise this post won’t be a downer. What it will be (hopefully) is really useful advice on how to portray the stages grief—and in the process, maybe encourage you to continue creating even during your own personal sorrow. “We must embrace pain and burn it as fuel for our journey,” said Kenji Miyazawa. Well, my friends: it’s time to break beautifully. Most of us have read stories portraying grief so spectacularly that we felt it as we read, weeping alongside fictitious graves. Of course, most of us have also read stories with grief that utterly failed to move us, which (I think we can all agree) is something we’d prefer not to write. At our hearts, we are all storytellers. It’s part of the human condition to explain the world to ourselves in a way we’ll accept. We rationalize. We imagine scenarios to help ourselves understand. They find a “why” of some kind and make peace with it (even if that “why” is “bad stuff happens and I accept that”). Or they have no “why,” and cannot shed the weight of the grief they carry. There’s reasoning in there, a why. The story your character tells herself gives your character direction. Does she blame the deceased for his death? Does she blame someone else, or hold to a faith in cruel fate that could strike again at any time? The story she tells herself can grow hope or prevent it from blooming. It determines the choices she makes in the wake of her grief. Homework Assignment: what story is your character telling himself? BONUS: By the way, this can give birth to a really great plot-twist. If a decade after the fact, evidence comes to light that blows the survivor’s rationalization to bits, then that survivor has a whole new set of motivations to carry your plot along. Boom: story. Along with that story, there will be symptoms of grief. These symptoms vary over the various stages of grief, and you should be aware of them as you describe your character’s grief. During the initial stages of grief, some or all of these might be present. Your character will not necessarily verbalize them; they could be happening “off-screen.” However, they will be happening, and that should make a difference how your character behaves – and how your readers empathize. Homework Assignment: how does your character handle immediate grief? Socially? Physically? Denial. Boy, can this take a lot of forms. Denial of the cause of death, of culpability, of grief itself – which leads to stress physically and emotionally, not to mention living in such a way as to prove that denial true. Forgetting the person is dead. I know that sounds bizarre, but it’s true, and it can happen years after the fact. Your character will find themselves reaching for the phone to call the person who died – only to remember they can’t. Corollary: Gut-punch sorrow upon remembering that loss. It feels a little like losing the person all over again. Forgetting the person, period. This isn’t heartless; nature abhors avacuum, and life tends to fill in the gaps that death digs. There will often come a time when your protagonist realizes she’s living as if that person never existed – and it will be a shock. Corollary: Resulting gut-punch of guilt, as if remembering were a sacred duty that must not be shirked. This isn’t as weird as it might seem. There’s a reason most ancient cultures cherished numerous festivals and sacrifices to and for the dead. Remembering matters. Living for the person. His mom was gonna be a dancer? And hey, looky there: twenty years later, he owns a dance studio, and he may not have even realized he’s carrying on her dream. The deceased made a statement or held a belief that the survivor feels is absolutely untrue. Death prevented any kind of satisfactory conclusion to their disagreement. Rationalization. Remember that story we tell ourselves? Over the long term, that story usually gets set in stone. If you know what your character’s story is, you will know WHY they do a lot of the things they do. It’s a powerful writing tool. Irrational fear of whatever it was that killed that person. (e.g., run over by a garbage truck, and therefore it is Horse And Buggy Time Forever). Continued Physical Symptoms of Stress. High blood pressure. Ulcers. Poor sleep. Refusal to let anyone too close. If the bereavement was not dealt with and the “why” does not suffice, your character can go through a whole host of horrible symptoms. Homework Assignment: How does your character handle grief in the long term? Do they embrace the cause of death, or run away from it? Has it shaped career choices? If you want your character’s grief to be powerful, you must learn to show it, not tell it. You could say, “She cried,” or you could show that her nose is stuffed, that her eyes are simultaneously dry and leaking, and that her voice is hoarse. Permit me to get personal before practice time. The years of 2011 to 2012 were rough. One of my best friends died, followed by my grandmother, then the college professor who was basically a surrogate father, and finally, my own mother. The causes varied wildly (aneurysm; age; hit-and-run; drowning). The timing was insane (February 2011; June 2011; December 2011; June 2012). It seemed I’d barely recovered from one loss when another would cut the corner to hit me head-on. To say it took a lot out of me is analogous to saying there are a lot of cats on the internet. The thing is, I had a debut book to finish. The Sundered was due to go public June, 2012. I couldn’t afford to take time off creatively. I had to write through it, and I did that by focusing on what I experienced and pouring it into the page. I wrote like a madwoman. Was everything I wrote good? Heck, no. No one will ever see most of what I wrote during that period (and believe me, you would thank me if you knew). But am I glad I kept writing? Yes. A thousand times yes. If you take nothing else from this article, take this: if you continue to create while you are grieving, you will survive it better. It’s not a “why.” It doesn’t make the loss less bad; but creation, like growth, only happens when we are living. Keep writing. Keep creating. If you must break, break beautifully – and then your characters can break beautifully, too. Has your character experienced grief? Have you? Let us know in the comments section. 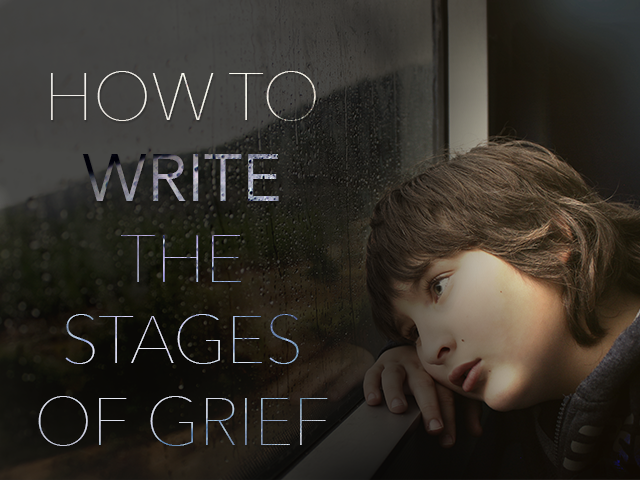 It’s time to practice writing your character through grief. Take fifteen minutes and dive into the story they’re telling themselves about this loss (the why), then post it in the comments section. If you share a practice, please comment on the stories of others.